This one is flowering now (bright pink). 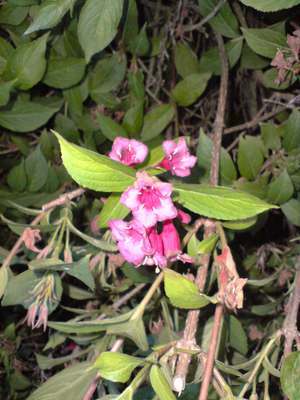 It's about 8 feet tall on a few long-ish stems from the ground (so kind of verging on tree-like rather than shrub). Does anyone know what this is please? Any help very welcome. When it has finished flowering, you can prune it - take each flowered branch back about a third to healthy buds, not forgetting to cut out dead bits, of course! It responds well to hard pruning as well if you want to reduce the size.